Speaking of Choices, the Norton Simon Museum in Pasadena has one of the choicest collections—not just in Southern California or the West Coast—but anywhere in the United States. One immediately thinks of the amazing collection of Old Masters ranging from Giovanni di Paolo, Botticelli and Raphael to major examples by Poussin, Reni, Rembrandt, Rubens, Zurbaran, Watteau, and Goya. And of course the superb 19th-century French things: earlier works by Courbet and Manet of course, but the Impressionist and Post-Impressionists include a near-comprehensive overview of Edgar Degas’ output in painting, drawing, and bronze. But wait, the 20th-century representation—if selective—includes superb examples that range from Picasso, Braque, Matisse, Kandinsky, Rivera, Moore, and Noguchi to Warhol, Francis and Ruscha, much of it a legacy from the visionary days of Walter Hopps’ Pasadena Art Museum (absorbed by the Norton Simon in 1974). That’s just Western art. Don’t forget the superb selection of South and Southeast Asian works, from Gandaran schist Boddisatvas to gilt bronze Tibetan sculpture. While the Museum’s span of art history is far from complete, it gives a good run for your money, and most importantly, quality trumps all here. Well, the Museum and its curators led by Carol Togneri, have figured it out: small, in-focus displays surrounding stellar paintings by such artists as Vermeer and Ingres. Special relationships have been formed with the Frick Collection in New York, the National Gallery of Art and the Metropolitan to borrow major works to show alongside the Norton Simon’s own collection. But it is with the current loan, Portrait of a Man, c. 1470-75, by Hans Memling from the Frick Collection that especially proves the point to this larger exercise. First of all, the picture itself is extraordinarily beautiful—of the highest quality. This is no surprise, coming as it does from the Frick (like the Norton Simon, a rare lender), but because the Museum has its own Memling to show alongside, and what’s more, Giovanni Bellini’s earliest known portrait which depended on Netherlandish (today’s Belgium and the Netherlands) pictures such as this Frick loan. One comes away from this succinct little show with a real understanding of the revolution in portraiture during the dawn of the modern age, the Renaissance. Displayed within the Museum’s collection of 14th-15th century pictures both Northern and Southern, the Memling Portrait of a Man commands center stage surrounded by several choice comparisons from the permanent collection. To the left is the Norton Simon’s own work by Memling, the Christ Blessing of 1478. Like the Frick Memling it is a bust-length image of a man, it is however by no means a portrait. The difference being of course the former is devotional and the latter documentary. More to the point, the telling comparison is to the right, the diminutive but highly important Portrait of Joerg Fugger of 1474 by Giovanni Bellini. Depicting the young son of a German banker residing in Venice, Bellini’s hometown, Joerg faces to the viewer’s left, in what is called three-quarter pose. While this may not seem revolutionary to us now, this portrait comes at the cusp of a completely new way of how humankind (at least in the West) portrayed—and thought of—themselves. While Joerg just wanted a fashionable souvenir of his sojourn to La Serenissima—that greatest of tourist attractions—and by a rising art star of his day, what he got was a new, casual, sensitive and spontaneous snapshot of himself to show off to friends. Bellini, in picturing his handsome, young client, responded in kind by giving Fugger the hippest portrait possible. 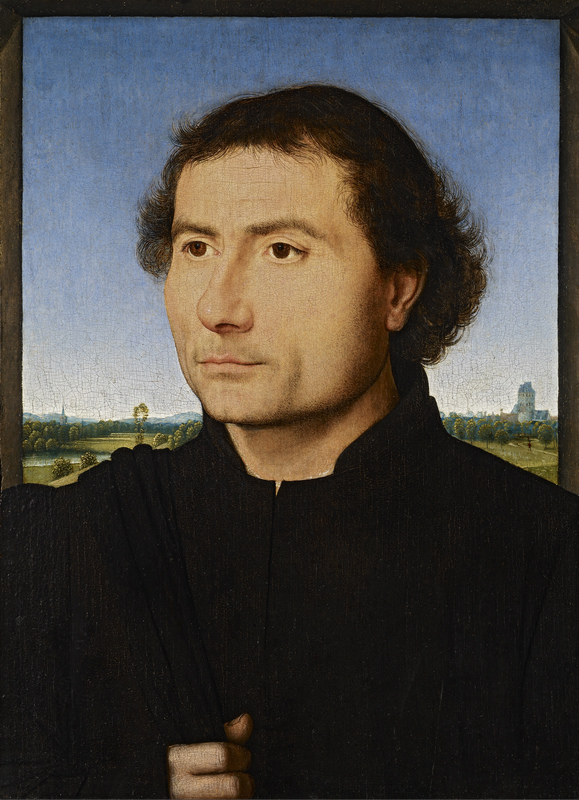 Italian artists of the day—Antonello da Messina, Bellini, his brother Gentile and others—were highly influenced by Northern naturalism as seen in paintings by the likes of Memling. These artworks were part of the flow of commerce, brought by the likes of Fugger and his father from Northern Europe. Likewise, oil paint was a recent import from the North, where Jan and Hubert van Eyck had reputedly developed the new medium. Finally, the very pose itself in both Memling and Bellini portraits—the three-quarter pose—broke with the centuries-old profile portrait (think of a head on a Roman coin), the ultra-formal manner in which living persons were heretofore shown. Now, the person portrayed turns his head to the viewer, as if reacting to our presence; soon artistic convention had their eyes engaging ours. With the Norton Simon’s Joerg Fugger, we discover precisely why Giovanni Bellini is an artist of utmost importance in the Italian Renaissance, as he experiments with the new medium of oil paint and with innovative compositional strategies (such as showing the Virgin and Child behind a ledge and within a beautiful landscape, an example of which is also in the Norton Simon, hanging nearby). The groundbreaking lesson here is that Memling, and Bellini like him, are showing us with these two portraits what it was to be modern in the waning years of the 15th century. Here they are demonstrating one of the key achievements of the Renaissance—that is the birth of the modern sensibility.